A calf is born February 1, 2017. Let's call him Sir Loin. The day he is born he weighs 75 lbs soaking wet. His mama will clean him up and hopefully in about an hour he'll be standing and getting his first taste of the milk that will nourish him for the next six months. Sir Loin gets stronger everyday. In a matter of days he'll be running with the other calves and head-butting his mom. In a few weeks he'll be mimicking the other cows trying to pick grass. His digestive system doesn't get much out of it, so he continues nursing. At this point Sir Loin is growing between 2 and 3 lbs/day. By the time he is six months old, he'll weigh between 500-600 lbs. He'll get the necessary vaccines and will be castrated if he hasn't already. He's young and healthy so he will recover quickly. His mama will be glad when we wean him around August 1, 2017. He doesn't go far though, just across the road with the other calves his age. Up until this point, most farmers do everything the same. Here is where preference comes in. Derek and I will keep Sir Loin and his siblings in a pen near our house until they are fully weaned. We do this because weaning can be stressful on calves and just like humans, they are most susceptible to illness when they are stressed. They have a basic diet of grass and hay and Derek and I check them every morning and evening to make sure all of them are eating and no one looks sick. When we feel like they are ready, we will introduce them to winter wheat. They'll spend the chilly fall and winter days munching the nutrient-filled blades of grass. We'll introduce them to a balanced grain ration, a mix of corn, soybean meal, essential vitamins and minerals, and molasses for taste. With the high protein content of the wheat and the high fat content of the corn, these calves will continue to gain about 3 lbs per day. On Feburary 1, 2018, Sir Loin will be one year old and we hope he will weigh about 1,000 lbs. Around this time, Sir Loin and his brothers will be moved back to the pen by our house. They will have full access to hay and every couple days we will increase the amount of corn they are given. This lets their digestive system adjust to the difference in their diet. All livestock have delicate digestive systems so it is important for us to be patient. By the beginning of March their diet will be about 85% grain, 15% hay. 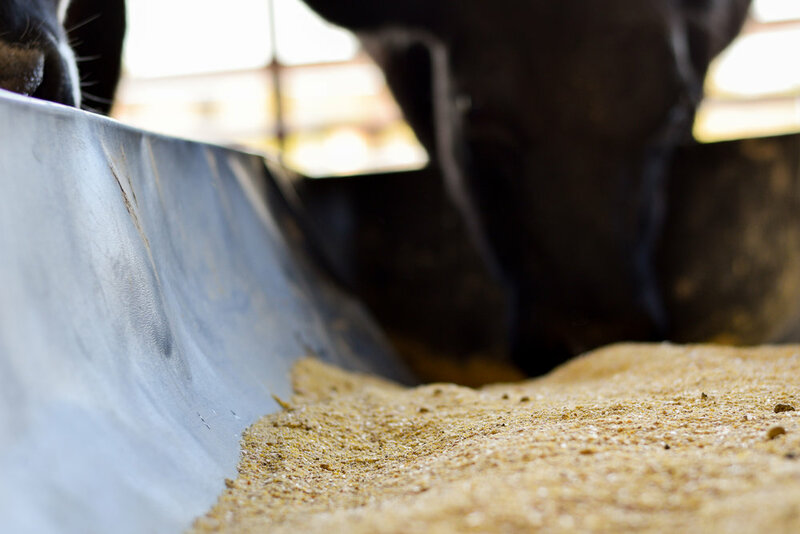 Even for grain fed calves it is important for them to have some fiber in their diet. This keeps their digestive system in great working order. As a result, these calves can gain about 4 lbs/day. Our goal is to "finish" them between 1300-1500 lbs, but this depends on the overall size of the steer. Let's say Sir Loin is completely average, what we would call a medium framed steer. He'll probably weigh 1400 lbs when his body is packed with perfectly marbled meat that is surrounded by a layer of flavorful intermusclular fat. When he reaches this point, we say he is finished. Have questions about grain fed beef? Click here. Now Sir Loin is 16 months old. He has had the best life an animal could ask for. He has been completely cared for. Unlike many wild animals, he never went hungry or thirsty, he was given shelter to protect him from the weather, and vaccines to protect him from illness. He was carefully watched to insure he was always happy and healthy. 1) We believe everything we have is a gift from God that deserves the utmost respect and care. 2) This is our livelihood. We sign our name on this animal. We genuinely want this calf to be the best he could possibly be for our family and for yours. When the day comes for Sir Loin to be processed, we take him to a processor we know and trust. When Sir Loin's body has been cleaned and hung up to cool, his "hanging weight" or "rail weight" will be about 63% of what he weighed "on hoof". Once the meat is processed and packaged, the meat the customer receives will weigh about about 60% of his rail weight. In this case, that's about 500 lbs of meat. About 50% of the meat will come in the form of ground beef. Of course, this depends on exactly how the customer wants the steer processed since there is a lot of flexibility. 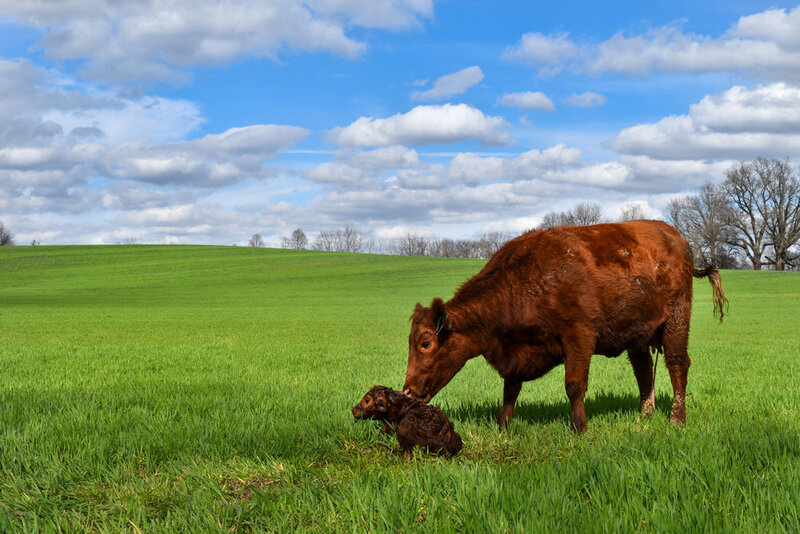 Just 17 months after a calf is born, a family can sit down together to enjoy flavorful, healthy beef that they feel good about because they know where and how this animal was raised. We are just two of many American beef producers, but I can say confidently that this is the collective goal of producers all over the nation. You may like to know that grocery stores and farmer's markets aren't your only options for buying beef. Many producers, like Derek and I, will sell our beef in bulk directly to your family. Purchasing beef in the form of a whole or half a steer can allow your family to eat premium beef without paying the premium cost, and having a freezer full of beef from a farmer you trust can put your mind at ease. Knowing your farmer is a very powerful thing. If you are interested in how we sell beef in bulk, you can find more information by clicking the "Selling Our Beef" button below. And that's it folks. Of course that's the whole beef story boiled down and condensed for a single blog post, so if you have any questions remaining I hope you'll ask.